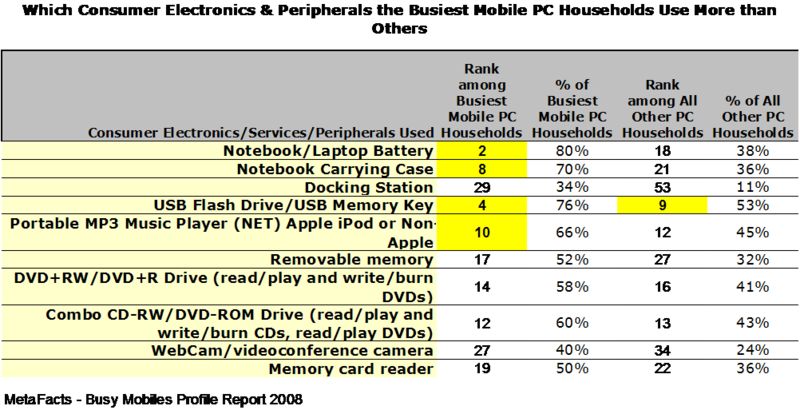 The Busiest Mobile PC Users have a different collection of consumer electronics and peripherals than other PC-using adults. Not surprisingly, many of them have something to do with mobility. The biggest percentage difference is between products specifically for notebook computers – batteries, carrying cases, and docking stations. Although these products are useful for less-busy mobile PCs, they evidently aren’t as often a requirement.